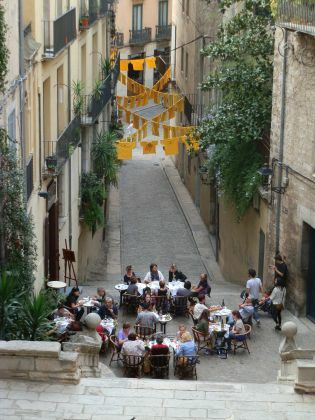 Girona is the closest city for the Costa Brava and capital of the comarca of Girones which takes in the whole of the north eastern corner of Catalonia. It's about 40-50km from the coast and so an easy day-trip for shopping or visiting. The city itself is famous for its old quarter - a collection of unspoilt streets with old arched arcades and trendy shops that sit above the Onyar river and climb up the Capuchins hill. This old quarter contains the Cathedral, to the massive old city walls, a number of other churches and former monestaries and leads to gardens around the newer medieval walls. Girona has a long and hard-fought history. The city sits at the edge of the Gavarres hills, which rise up behind the city, on the confluence of the river Ter (from the Pyreneeds) and Onyar (from Montseny). It is therefore historically and strategically on an important gateway into the Iberian Peninsula. Over the years, Girona is a city which has been besieged about 26 times with the ebb and flow of Spanish and French influence on the area and in the Napoleonic wars was briefly the capital of the French department of Ter. We're visiting at the festival of Sant Narcis, the patron saint of the city in what is Girona's Festa Major. Legend has it when Girona was occuped or beseiged by the French, huge flies emerged from the sacred remains of Sant Narcis and attacked the french soldiers and horses causing many deaths. As a result, across the streets and on the floor are banners with flies - the city's symbol. It's useful to understand the geography of Girona as it helps explain where the key parts of the city are. Girona has Iber origins, but the start of the city of today came with the Romans who created the first town (Gerunda) in a triangle formed by the Onyar, the stream of Sant Daniel, and then up into the hill of the Capuchins. This is a relatively small area and the current situation of the Cathedral and Casa del Alemanys. Over time the city grew to the South along the river Onyar in what has become the Barri Vell old quarter. It was also heavily fortified, but in the 19th century the fortifications were removed and the city grew on the opposite side of the river. As a result the train station side of the town is quite modern and a contrast to the old original city areas. Girona's location as a gateway to Spain and a key route for invaders from France, is combined with the importance of Girona as a religious centre meaning a large number of historic buildings, fortifications and churches in a relatively small area. We're broadly ambling through the city looking for nooks and crannies so pretty much like tourists starting from the batch of Cortes Ingles buildings just south of the train station. Cortes Ingles is the main Spanish department store, comparatively expensive but with relatively high quality products - sort of like a House of Fraser or John Lewis. We walk up to the station to see a bricklaying competition which is part of the Festa Major. Teams of bricklayers are making copies of a complex chimney structure. All the teams are making the same structure from the same plans and it includes slopes and diagonals and by no means easy to construct. Each one is freestanding with verticals and angles carefully marked out with wooden splints so as to get the lines correct, and the teams sweating to build the structures as quickly as possible. From the station we zigzag through the new part of the city. The modern area has the main shopping chains and standard clothes shops. As a result, the first impressions that most people get of Girona from the station are of a work-a-day city. 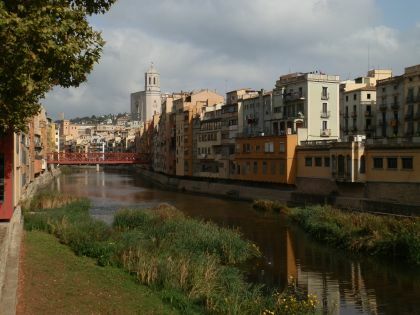 It's not until we get to the Onyar and cross the bridge that we get to the classic Girona view of tall terraced houses standing over the river with the cathedral dominating in the background. We cross the river at the stone road bridge, browsing at the craft market stalls on the bridge for the festivities. Immediately on the other side of the river we have the older part of the city. Deep arcades provide shade from the hot sun and restaurants have tables out on the pavements. The Barri Vell is practically car free except for the odd intrepid local resident. The streets run in three parallel routes towards the Cathedral area with lanes and arched link paths connecting the roads and steps and climbs on the leftmost street linking to the higher parts of the old town. The shopping is ecletic with many small boutiques and specialist shops mixed in with bars and restaurants. 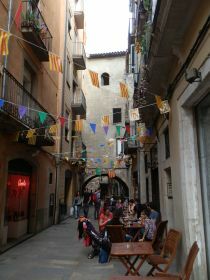 We weave through the alleys and streets festooned with colourful banners marked with a housefly graphic, gradually making our way towards the Cathedral area at the end. The past the Cathedral and out through the enormous old wall and main city gate. Parts of the wall here are roman and the wall itself is both extremely thick and high. We turn back towards the Cathedral, drawn towards the church of Sant Pere de Galligants with its romanic tower just at the end of the Sant Daniel valley. The area is quiet with gardens at the back of the Cathedral and we realise we're standing close to the Arab Baths. 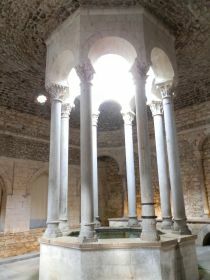 The baths are part of Girona's medieval heritage built to imitate muslim style baths. The baths now are a series of rooms lit by open geometrical skylights that bring light flooding into the space and a pool of water under columns that reach to a skylight. Unlike the rest of Spain, Catalonia was only under Moorish control for about 80 years (718 to 801), however, Girona cathedral sits on the site of a mosque from that period. Girona also has vesitages of its Jewish inhabitants in the Call Jeue. From the Arab baths we wander out to Sant Pere. A guitarist is playing classical guitar in the courtyard just outside the church. The lane behind the church links up to Sant Daniel path and up into the Gavarres. Though we are in the heart of the city at this point it's almost like a finger of the countryside is touching the ancient heart. The gardens at the back link up to the Cathedral now dominating above us on the hillside. We climb through the steps in the gardens to reach the Casa del Alemanys, then follow the paths back down into towards the city seeming to pass church then monestary then church. 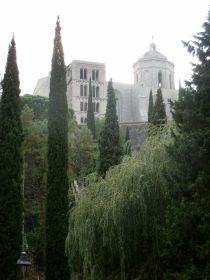 The area now houses the University of Girona but previously there were seminaries for priests. 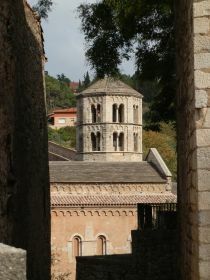 The monastic buildings were also used as makeshift jails during Franco's time. The paths and steps down run back into the Barri Vell and, as it's lunch time, everyone seems to be eating outside. For October it's unseasonally warm. As with most of Catalonia, when lunch comes everything bar the restaurants shut down. 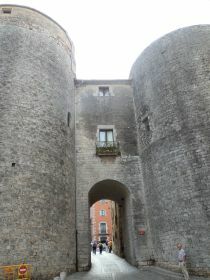 We leave Barri Vell by the metal bridge into the main square where stalls are selling meats and cheeses. A man with a clowns nose is playing trumpets and drums as a very tuneful and fun one man band with a handful of children dancing to his song. We cross over the road to the Devesa Park hoping to see something on the stage, but being lunchtime it's closed - only a few stalls selling roast chestnuts are open. Further down into the park are the fairgrounds but we give those a miss and gently wend our way back.